Taya Hatun Cad. N5 Sirkeci, 34120 Istanbul, Turkey. Hotel Sirkeci Konak Sirkeci is located in the heart of Istanbul's neighborhood and from our location we invite you to explore the mysteries of two thousand years. In the hope of capturing the spirit of the area, our KONAK's atmosphere decor and design take a revolutionary approach combining 19th century style and 21st century comfort. Sirkeci Konak has been created by the team that is in love with Istanbul and hosting; Sirkeci Group Hotels and Restaurants. 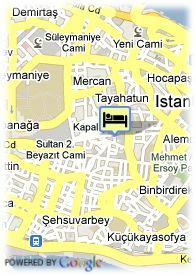 As soon as the hotel opened its doors Sirkeci Konak became one of the important hotels among Istanbul Hotels. The word 'Konak' is defined as a large mansion house which is generally used as an official residence in Turkey and the former Ottoman Empire. 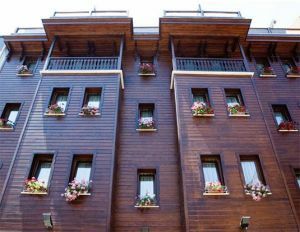 Hotel's architecture is based on the classical Ottoman Konak style. Sirkeci Konak is located right at the center of the historical peninsula - old city of Istanbul. Being a guest in the hotel is an experience of Turkish and Ottoman hosting tradition. Sirkeci Konak has a swimming pool, sauna, jacuzzi and a traditional Turkish bath. Rooms have a view of the Gulhane Park. Near trainstation, Centre, Museum Area, Near the historic centre, Near subway / tramstation, Near shopping centre.